By announcing annual Prime Plants for Nature awards we hope to encourage you to plant native plants that have exceptional ability to support wildlife. These plants contribute significantly to the web of life by hosting insects, offering nectar and pollen, or producing fruits, seeds or nuts for birds, butterflies, and other insects and animals. Some of the award-winning plants perform all of these functions. Our selections, all native to southeastern Pennsylvania, will make attractive additions to your landscape, are readily available at native plant nurseries or native plant sales, and are easy to grow. By incorporating these plants into your landscape you will be helping to create a healthy ecosystem on your property. Each year we will announce awards in two categories: Trees and Shrubs and Perennials. August. Like other milkweeds it is an important host plant for Monarchs, a declining species of butterfly.The flowers produce nectar used by many butterflies, bees, and other pollinators. 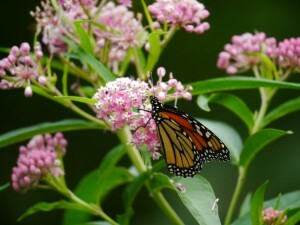 Monarch on Swamp Milkweed (Asclepias incarnata) in Barb’s garden. July 9 2012. Photo © Barb Elliot. Click to enlarge. Milkweed Bugs, Milkweed Leaf Beetles, and some other insects feed on this plant, too. Native to eastern and central United States, Swamp Milkweed is deer resistant and will thrive in sun or part sun in moist or average soils. A showy grouping of at least three, preferably more, of these milkweeds will attract egg-laying Monarchs and a variety of nectar-seeking butterflies and pollinators. White Oak. 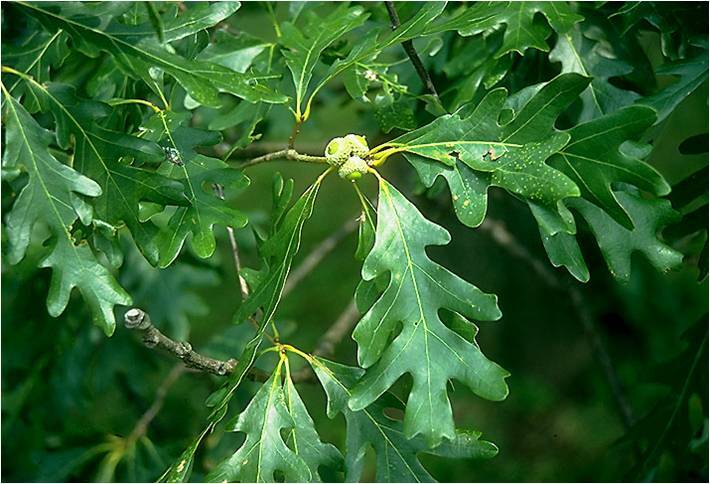 Oaks host more insect species than any other plant, including 534 species of butterfly and moth caterpillars, critical foods for adult birds and their nestlings. The acorns are eaten by nuthatches, jays, woodpeckers, crows, squirrels, and other animals. This tree is, therefore, a major source of food for birds and other wildlife. 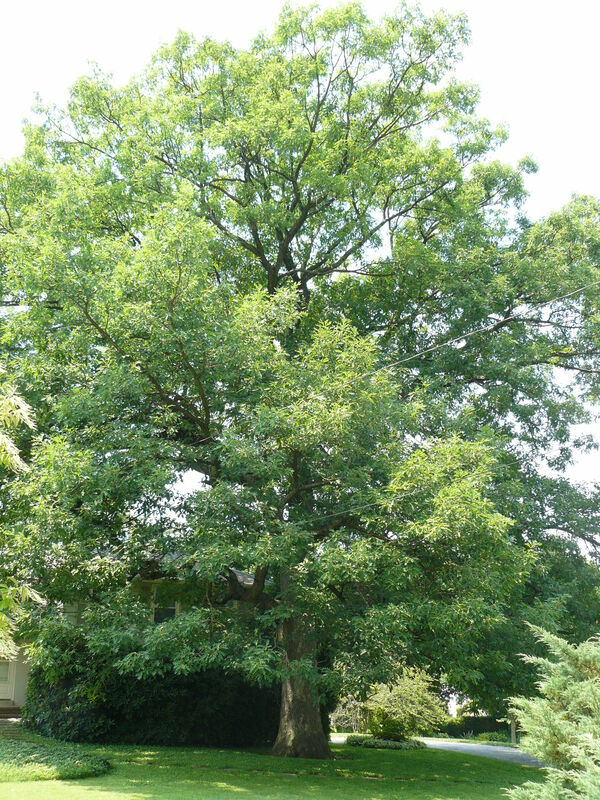 White Oak is slow growing, but it is disease-resistant and will eventually become a 60 to 85-foot majestic tree. White Oak (Quercus alba). Photo © Barb Elliot. Click to enlarge. It can live for 300 or more years–all the while offering food, shelter, and nest sites to myriads of animals.With its long taproot this eastern North American native is difficult to transplant and should be planted as a young tree. This quintessential wildlife plant will grow in sun or part-sun in dry to moist soil. We strongly encourage you to consider adding one or both of these exceptional native plant species to your garden this year. You can check for these plants at the suppliers listed below.